Problem: Mozilla Firefox has this awesome account synchronization feature. This feature, called Firefox Sync, syncs your bookmarks, passwords, add-ons, tabs, preferences and history to other devices with a Firefox installed. However, I ran into an issue recently that a computer died and the user was using Firefox. This user hadn’t set up a Firefox Sync account so I couldn’t sign into his account to get all his bookmarks and history, etc. Here is how to move a Firefox profile manually from one computer to another. Please follow the instructions carefully, it can be slightly tedious. Step One: We first need to grab the Firefox profile off the old computer or hard drive. On the old computer, browse to (Windows XP) C:\Documents and Settings\<username>\Application Data\Mozilla\Firefox\Profiles; (Windows 7,8, 8.1) C:\Users\<username>\AppData\Roaming\Mozilla\Firefox\Profiles. You will find under the Profiles folder a xxxxxx.default profile. 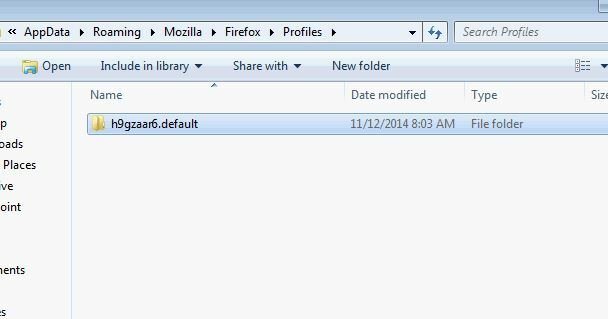 Copy the Firefox profile folder to a flash drive or network location. Step Two: Go to your new computer. Install Mozilla Firefox. If you are running Windows 7 or 8/8.1 go to C:\Users\<username>\AppData\Roaming\Mozilla\Firefox\Profiles. Under the Profiles folder you will find a profile name (normally a string of numbers and letters with .default at the end). Make sure Firefox is closed and cut the new Firefox xxxxxxx.default folder to your desktop. Step Three: Ensure Firefox is closed on the new computer. Get your flash drive and copy the Firefox profile from the old computer into the C:\Users\<username>\AppData\Roaming\Mozilla\Firefox\Profiles (Windows 7, 8 or 8.1) folder on the new computer. Step Four: Go to your desktop and copy the name of the new computer’s Firefox profile. 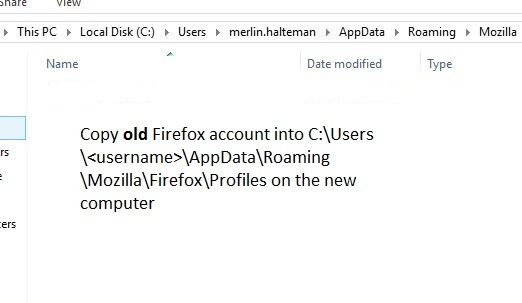 Next, go back to the profile folder (C:\Users\<username>\AppData\Roaming\Mozilla\Firefox\Profiles) on the new computer, and rename the old computer’s Firefox profile to the exact same name of the new computer’s Firefox profile. In my case, I would rename the new Firefox profile (35jar636.default ) to H9gzaar6.default . Open Mozilla Firefox and everything will be there just like your old profile. I hope this helps you. Let me know in the comments if you have any questions or if it helped you. Thanks. 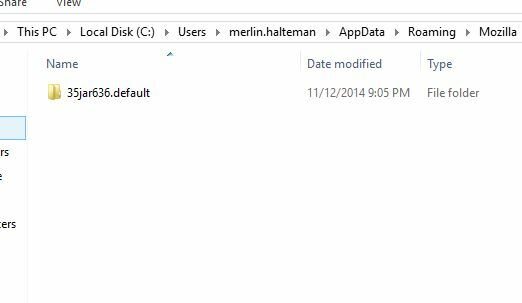 This entry was posted in Tips and tagged Firefox Profile, Firefox Sync, Mozilla Firefox on November 12, 2014 by Merlin Halteman. You are a rock star.m worked perfectly! I am sooo happy!